A mother’s worst fears are almost always centered on her children. 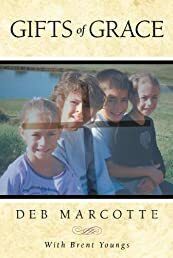 Gifts Of Grace is the compelling and true story of Deb Marcotte’s worst nightmare becoming an unimaginable reality. As Deb anxiously awaited the results of the CT scan, she had almost convinced herself that her four-year-old daughter, Allie, was fine. A glance at the medical chart showed otherwise. Deb’s heart sank as reality was confirmed by the doctor with words that sent her world spiraling – “It looks like she has had a stroke. But there are older strokes that are present as well.” Guilt, fear, panic and an avalanche of other emotions erupted as Deb began to tearfully attempt some level of control. As she had done so many other times, Deb turned to God. Deb prayed for strength and understanding. She prayed that her faith would overcome her questions. This was the beginning of countless medical procedures in hospitals around the country. Allie would endure multiple brain surgeries and endless tests as medical experts worked to find a cure. Deb remained strong in prayer and even stronger as Allie’s advocate. Gifts Of Grace is an unforgettable story of a young girl’s inspiring strength, a mother’s unbreakable faith and indomitable spirit, and a loving God’s everlasting gifts.